Let's hear it for the Red, White, and Blue! I have been cookie crafting a bit in the kitchen recently and I came up with these Patriotic Groove Cookies. Don't you think they would make a splash on your Memorial Day or 4th of July Table? Mix sugar, butter, milk, vanilla and almond extract, and egg. Stir in flour, baking powder and salt. Mix until well incorporated. Divide dough in three equal parts. Leave one part uncolored for the white dough; color one part of dough with red coloring; color another part of dough with blue coloring. Form all three dough parts into rounds. Then flatten into disks. and cover and refrigerate for at least one hour. Sometimes I cheat and place the rounds in the freezer for about 20 minutes. 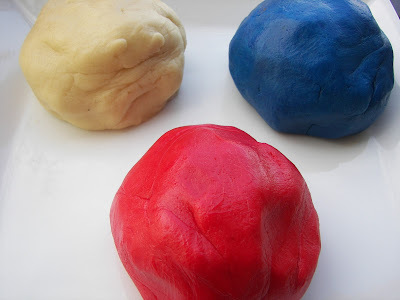 Take dough and combine the three colors to make a cookie, about tablespoon size or a little larger. Place cookie dough balls on baking sheet and flatten slightly with the bottom of a drinking glass. Bake in 350 degree oven for 8 to 10 minutes. Cool on wire rack for about 5 minutes. Notes: I loaded my colors into a cookie scoop, but you could just press the colors together to make them. 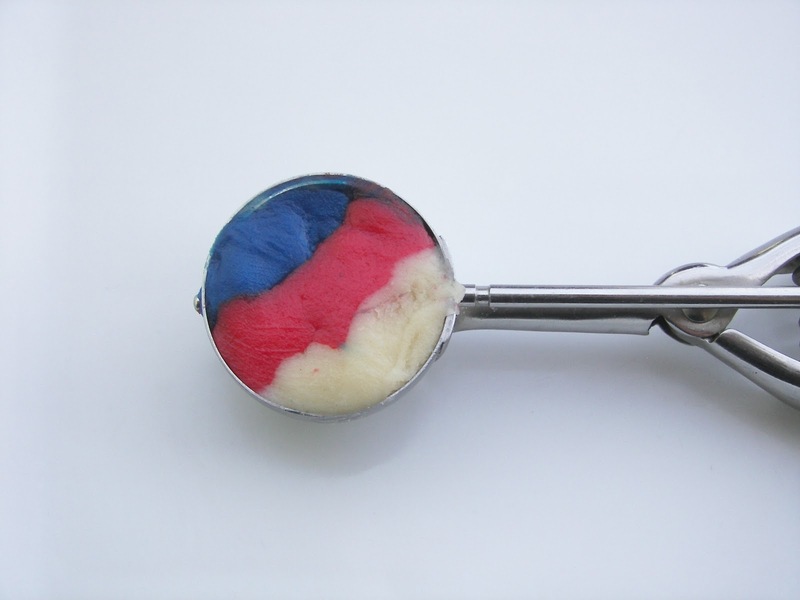 If you DO use a cookie scoop, make sure you clean the scoop out, with a paper towel, after you form each cookie so that the colors won't transfer. The cookie recipe is from an old Betty Crocker Cookbook. I have used this basic recipe many times in my cookie crafting. The old red, white, and blue." Partial lyrics to the song, "The Old Rd, White, and Blue." Thanks for dropping by my Red Couch! 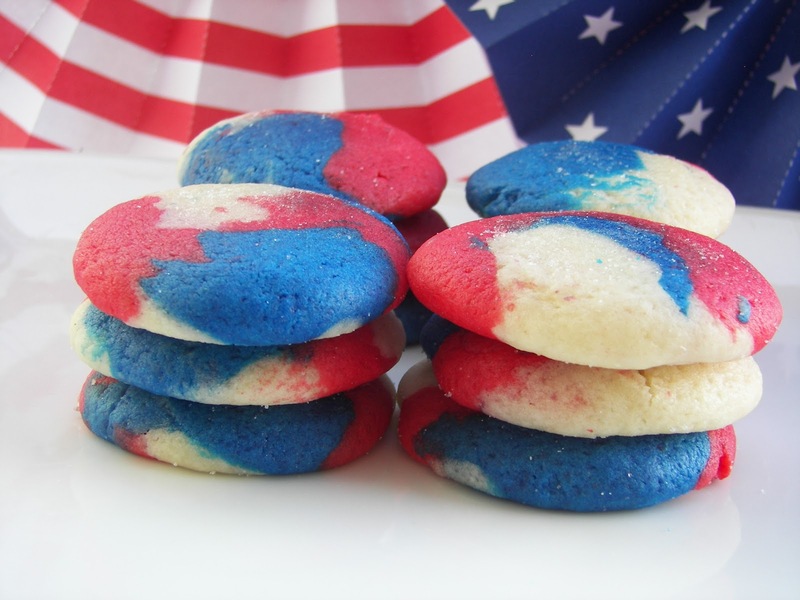 I hope you will add some pizazz to your Memorial Day or 4th of July table with these cookies. These would be really fun to serve. Everyone from children to their grandmammas would love them. So cute! These would be cute packaged with a little note that says "Made in the USA" or "made in America". Thanks for sharing! These remind me of Crazy Vanilla ice cream... exactly the same premise. 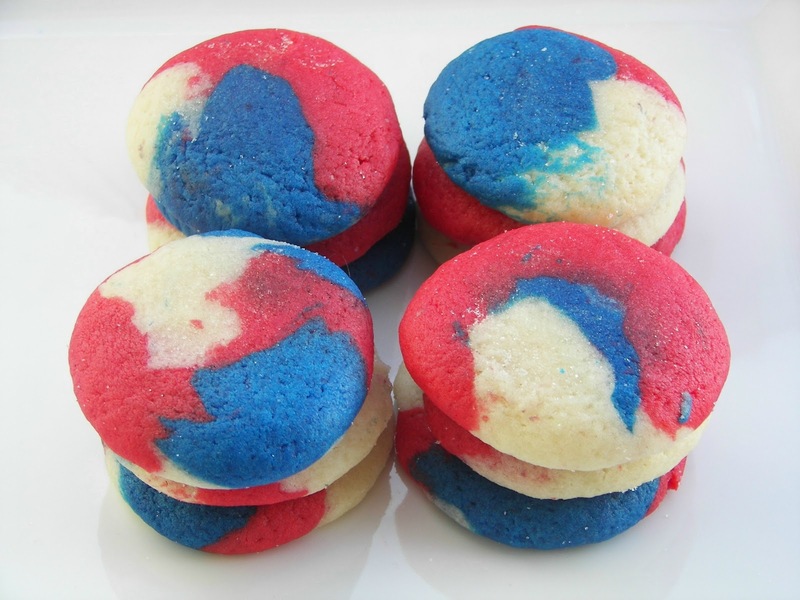 These are definitely a twist on the red, white, and blue food theme. Love it!! I love them! Cheery, bright and patriotic. You are my Queen of Cookies! Perfectly festive for patriotic days! I really like this idea. It's simple yet special. These cookies are so cute!! My grandchildren would love them. Plus they are perfect for Memorial Day and 4th of July holidays. Have a great weekend!! I'll bet those will be a hit! Oh Joni, you got me wanting some cookies now! Those turned out so darling! Great pictures! 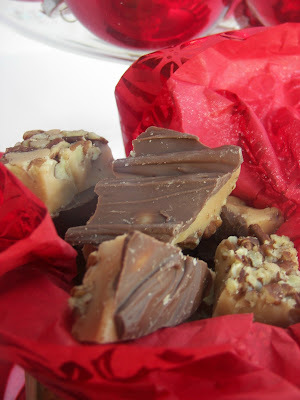 We have lots of July birthdays in our family so I just might have to try these! Great cookies, Joni. 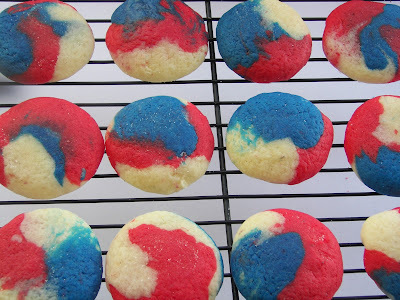 These will be perfect for a 4th of July cookout (if our weather ever gets warm enough that is)I have some grandkids who would think their grandma was really if she made these festive cookies. Your cookies are really lovely, Joni! Knowing you, I'm sure they are very tasty as well. Blessings to you and your family. Sorry I have not been around as often lately; I started back to full-time work a few weeks ago. 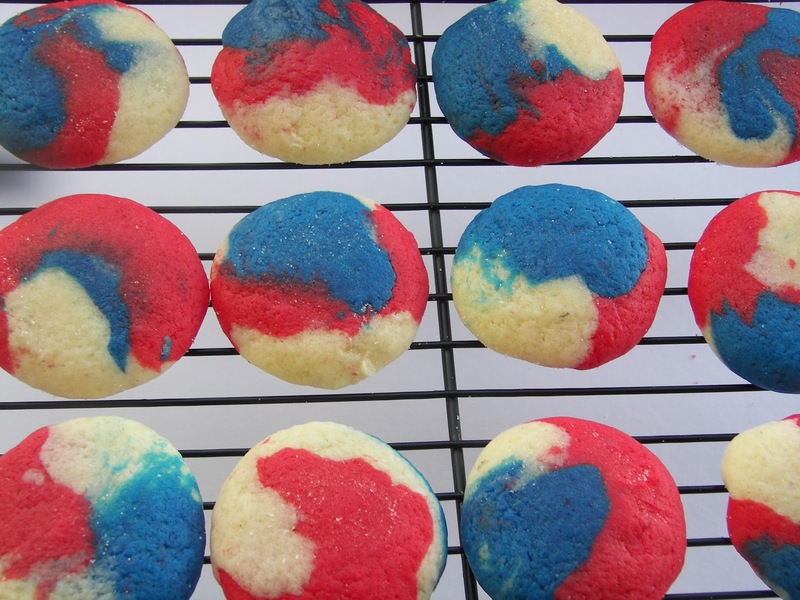 What a fun cookie for Memorial Day or July 4th and how easy. I love how colorful they are and I know some grandkids who would like to be in on the making and the eating of these. They are always looking for something sweet at grandmas and would stick their noses right up to the oven window to watch them bake. This is awesome! Thanks for some really cool ideas. I hopped over from Betty Crocker's post on Facebook. Love this cookie idea. I've done this with pastel colors at Easter, too. Thank you for sharing! You have a new follower! Could you possibly make this into a log and do slice and bake cookies? I have an old Betty Crocker cookbook, too, and keep going back to it again and again. Those are the cutest...I bet they'd be great for making little sandwich cookies! These are so cute! I love patriotic dishes so much - they're like an added bonus to "just having dessert". Can you use any of the refrigerated sugar cookie doughs out there? Looking for any short cut I can take. I have the grands coming for the weekend. They would think these are fun! yum! These look awesome! I enjoyed looking around your blog! 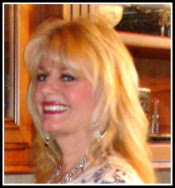 I am your newest follower and would love if you would check out my blog and follow me too! thanks! Happy birthday to you, happy birthday to you, happy birthday dear Joni, happy birthday to you. And many more! I hope the day is fabulous and that you are showered with blessings. These cookies are awesome! I'm saving this one for 4th of July! I'm here to wish you a Happy Birthday. Hope it is filled with fun surprises! fun cookies and happy bday! "HAPPY BIRTHDAY JONI"!!!!!! !I hope you have a wonderful Birthday week. AND thank you for this great patriotic recipe. They look delicious! Have Fun Today and everyday. Happy Birthday Joni! Hope you have a great day. These cookies look fun! Happy Birthday bloggy friend! Have a fantastic birthday and year, Joni! I hope you will be joining us this weekend for The Pink Saturday 3rd Birthday Celebration. I've missed you. Cute! Would love for you to share these on my Memorial Day recipe linky on CajunSugarPie.com! You always come up with the coolest ideas for holidays! Love this idea! These are so neat. I'm going to bookmark them for the Fourth of July!